How a 20-something entrepreneur gives businesses of all sizes a star turn. When Jason Sadler makes an outfit change, thousands of people pay attention. No, he's not a fashion model. But as the founder of IWearYourShirt.com, Sadler does get paid to wear clothes. IWearYourShirt takes the traditional idea of product placement and flips it on its head. Instead of tacitly introducing branded goods or services into the story lines and plots of movies and television shows, which is the norm for product placement, Sadler produces constantly revolving comedy sketches that focus on various advertisers' products and services -- all while wearing a T-shirt emblazoned with a different advertiser's logo each day. 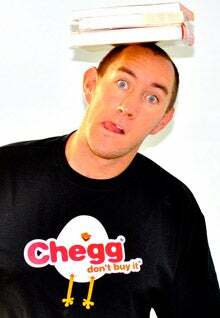 Sadler wearing the T-shirt for Santa Clara, Calif., textbook-rental company Chegg.com. For Santa Clara, Calif., textbook-rental company Chegg.com, that involved a colleague dressing up as the company's mascot: a cracked eggshell with two chicken legs and a beak named Shelly. Sadler filmed himself and Shelly interacting with Chegg's employees -- thumb wrestling, playing ping-pong and even giving one Chegg staffer a noogie. "It's like a reality TV show for advertising," says Sadler, 28, who has been known to don a wig -- and even a dress -- to creatively interact with a sponsor's product or service. But rather than simply sell, which might confuse IWearYourShirt's programing with, say, an infomercial, the Jacksonville, Fla.,-based entrepreneur's goal is to contribute to the conversation around those products or services -- to "pull" rather than "push" out his message. Although blatant advertising, as many as 50,000 consumers actively watch IWearYourShirt's barrage of daily programing -- which now includes three hours of live streaming over Ustream, five one- to four-minute YouTube videos, posting pictures to Flickr and Facebook and sending out constant updates over Twitter. Related: Who Is Jason Sadler, and Why Should You Care? IWearYourShirt's client roster includes businesses of all sizes from book authors and inventors to enterprise software maker Citrix and Nissan. In 2010, Sadler's company more than doubled its revenues to $200,000. This year, Sadler expects IWearYourShirt to reel in $250,000. 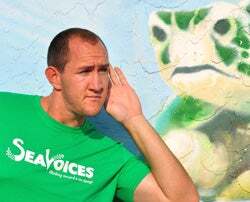 Sadler, communing with sea turtles for wildlife-preservation organization Sea Voices. Why do people tune in? Between cross dressing for Fort Smith, Ark., vintage-clothing outfitter Beauty's Boutique and speaking with pictures of sea turtles and dolphins on a mural for wildlife-preservation organization Sea Voices, Sadler's videos are anything but boring. Another reason is that advertisers often offer free product samples to viewers who post messages to IWearYourShirt's Facebook or Twitter pages. But according to Sadler, the draw may be more personal. "I think a lot of this has to do with people watching me grow my personal brand. They know I'm just a regular guy and not a superstar," he says. "If the whole show was about the sponsor, no one would ever watch." Advertisers have realized they need to engage their audiences, says Alina Wheeler, a marketing consultant and author of marketing primer Brand Atlas: Branding Intelligence Made Visible. "Today, social networking has changed the conversation," she says. "Now it's two-way conversation between a customer and a brand." There's nothing new about advertising on T-shirts. But it has become increasingly popular. At this year's South by Southwest Interactive conference in Austin, conference-goers were not only bombarded by logo-filled T-shirts, they also saw scores adorned with QR codes -- which connect names, numbers and other data to physical objects using the camera on a smart phone or other portable device. With this in mind, companies of all sizes have consistently snapped up days on Sadler's calendar -- which started this year on Jan. 1, at $5 a pop. The fee for daily sponsorships rises by $5 a day up to $1,825 on the final day of the year. Companies may also pay $5,000 to have their logos featured every day in a single month. And for $25,000 they can become IWearYourShirt's "proud partner," which gives them a year of coverage. The fees, which began at $1 on Jan. 1, 2009, have become pricier. But this year Sadler brought in a troupe of four other T-shirt wearers. Since each person performs their own social-media outreach on behalf of that day's sponsor, the price went up accordingly, says Sadler. The results can often be striking. For its part, Chegg, which purchased two monthly sponsorships, four calendar days and established a unique campaign for one week last year, IWearYourShirt's videos garnered more than 370,000 views on YouTube over the period. Chegg also added 4,000 Facebook fans and more than 5,000 Twitter followers. "We wanted to do something creative," says Tina Couch, Chegg's vice president of communications. "We knew that there was a lot of buzz around [IWearYourShirt], and it gave us an opportunity to engage our target audience through social media." Of course, traditional advertising still has a place, says Sadler who before launching IWearYourShirt in 2009 owned a boutique Web design firm. But he remains convinced that in today’s social media-infused world, marketers need to be more communicative. "You don't buy something because you saw it on a billboard. You buy things because your friends tell you to," says Sadler.